Seven years have passed since the 2011 Tōhoku earthquake and tsunami. It is seven years since the 2011 Tōhoku earthquake and tsunami. We offer our sincere condolences on the death of victims of the unprecedented tragedy, and we express our gratitude to those who have worked in restoration assistance following the disaster. Iwate Prefectural Museum, where thousands of cultural assets that were damaged by tsunami have been treated for stabilization treatment, held panoptic exhibitions from March to May, which demonstrated to us the importance of conservation of tsunami-damaged assets. During these exhibitions, we exchanged information with specialists involved in stabilization work of damaged assets. Two exhibitions, “Asu ni tsunagu Kesen no takaramono–Tsunami de hisai shita Rikuzentakata shiryo wo chushin ni (The treasures of Kesen that we pass on to the future generations –with a focus on tsunami-damaged assets in Rikuzentakata)” (March 3rd to 28th, 2018) and “Mirai heno yakusoku–ima katari hajimeta Kesen no takaramono” (A promise to the future–the treasures of Kesen that start to talk now)” (April 3rd to May 6th, 2018), introduced the damaged cultural assets that stabilization treatment of which was finished. During the opening ceremony, the deputy director general of our institution, Eriko Yamanashi, gave a congratulatory speech by guests, instead of the director general, Nobuo Kamei, who could not come to the museum. In the private view, the director of Center for Conservation Science, Chie Sano, gave an explanation of our study on the stabilization processing of tsunami-damaged documents. It seemed that the exhibitions were strongly motivated activities. There were descriptions of every asset’s condition before stabilization, and stabilization methods used, as well as the cultural assets that stabilization treatment of which was finished. Through seven years of the work, stabilization treatment of 220,000 items, out of 460,000 damaged items, has been completed. However, 240,000 cultural assets are still awaiting stabilization in the museum. The number of tsunami-damaged assets is enormous. In addition, the assets have many types of problems such as unpleasant odor. We would like to contribute to the conservation of damaged cultural assets through scientific study. Natural disasters, such as earthquakes and typhoons, are causing serious damage to cultural property. 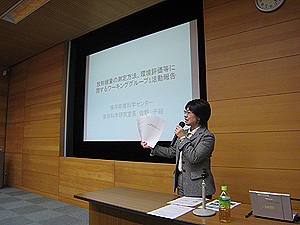 The National Institute for Cultural Heritage has conducted interviews with museums and prefectural offices regarding the risk management of cultural property all over Japan in order to build networks providing for disasters, because it is necessary to protect our cultural heritage and pass it on to future generations. We are in charge of Hokkaido and Tohoku areas, and conducted an interview with Tohoku University of Art and Design on September 15. 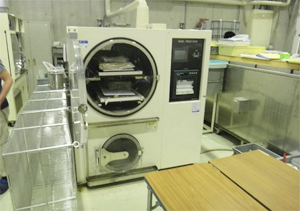 In the university, documents that were damaged by the Great East Japan Earthquake have been subjected to a freeze-drying process in order to dry them. We obtained information giving a detailed description of the time of the disaster in 2011. In addition, we learned about some problems and tasks on site. Through these interviews, we found that there were many types of risk management for cultural property in each region. We will continue to conduct interviews, and aim to build Cultural Heritage Disaster Risk Mitigation Networks that help people and protect our cultural property when problems arise. Many thousands of cultural properties were severely damaged by the tsunami that occurred following the 2011 Off the Pacific Coast of Tohoku Earthquake. Although six years have passed from the disaster, treatment of the tsunami-damaged cultural properties continues in the disaster-stricken areas. 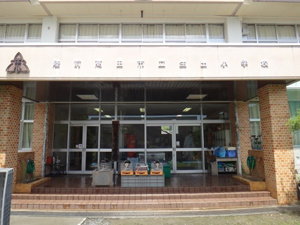 In order to investigate the occurrence of volatile organic compounds, which are harmful to workers’ health, we made a contract with Rikuzentakata City and conducted a survey on the treatment methods for the tsunami-damaged cultural properties and on the working environment in the facility where treatments are conducted. We visited the treatment facility in the Rikuzentakata City Museum, which is located in a temporarily closed school facility in Iwate Prefecture, for on-site research in August from the 25th to 26th. Damaged folk cultural properties are bathed in water for desalination in the school yard. On the first floor, paper documents are treated for desalination in a teachers’ room and cleaned natural history specimens are classified in a classroom. Treated objects are stored separately according to each type of cultural property in the classrooms on the second floor or a temporary installed storage facility in the gymnasium. 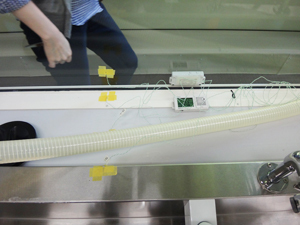 We were able to obtain a lot of valuable data about the air quality in the facility and water quality during treatment, helped by the cooperation of the museum staff. Temperature and humidity in the facility are continuously measured even now. By the end of this fiscal year, we plan to propose improvements after collecting data. We have been conducting a joint project with the Iwate Prefectural Museum to determine the methods to stabilize the paper materials damaged by the tsunami in the City of Rikuzentakata, Iwate. In Iwate Prefecture, many documents and other paper materials were damaged by the tsunami that hit the area in 2011. We have already stabilized approximately 90,000 paper materials, but it is still unclear when we will be able to complete the work of stabilizing all the damaged materials. The joint study conducted up to last fiscal year has enabled us to estimate almost all causes of the odors emitted from the paper materials. In this fiscal year, therefore, we have been working on establishing the methods to eliminate the odors from the stabilized materials, and also on a plan to keep records of the stabilization processes to determine how to improve them and what conditions cause paper materials to develop odors. On May 17, we visited the Iwate Prefectural Museum to discuss plans for this fiscal year as well as to install some equipment, together with our co-investigator, Mr. Hideo AKANUMA, in the conservation and restoration laboratory for tsunami-damaged cultural properties of the Rikuzentakata City Museum, which is located next to the Iwate Prefectural Museum. In this laboratory, we tentatively installed the equipment to monitor water temperature and oxygen concentration levels, and also installed surface temperature/humidity measuring equipment to check the temperature and humidity of the laboratory as well as to identify the transfer of temperature inside it. We plan to conduct joint investigations in June and July, each for a period of approximately one week. In the wake of a gas fumigation incident due to an erroneous agent in 2010, five gold picture screens became discolored. Based on the method that was determined as a result of discussing a policy for addressing the issue among parties concerned, including the Tokyo National Research Institute for Cultural Properties (TNRICP), these gold picture screens’ surface had been stabilized since 2012. They were finally returned to the Ekingura (Konan City, Kochi Prefecture) on April 17th, 2017 (carried out of the TNRICP on April 14th). With the screens’ safety as top priority, as a treatment to stabilize the surface, the following measures were taken: 1) The screens were dismantled to perform cleaning to remove the agent on the paper; 2) Prevention of the exfoliation of a paint layer, repairing of the paper, mending of a rupture of the paper, replacement of the lining paper and retouching of the repaired places; and 3) replacements of the foundation, osoigi frame support, karakami lining paper and metallic materials and reconstruction into a 2-panel folding screen. Each screen was packaged in order of a gas barrier bag, a screen bag and a cardboard box and delivered by a land vehicle specifically designed to transport art objects. 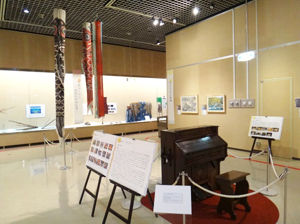 In the presence of the Kumamoto Art and Culture Promotion Foundation, to which they were returned, the five screens were stored in a treasure house safely and the Ekingura Management Committee, the Akaoka Gold Picture Screen Preservation Association and those parties concerned in Kochi Prefecture and Konan City appeared to be pleased. Though it was unfortunately rainy, when the truck arrived and the screens were carried in, it stopped raining as if the parties’ wishes came true. The TNRICP will give advice on a preservation environment for the gold picture screens from this point onward. A meeting of the Liaison Council for “Disaster Prevention of Intangible Culture Heritage” was held at the Tokyo National Research Institute for Cultural Properties (TNRICP), on August 22nd and 23rd, attended by persons in charge of cultural properties in eastern Japan. 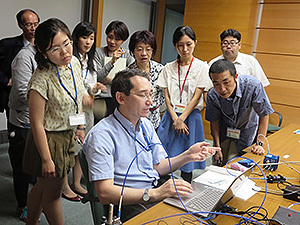 Since July 2014, the National Institutes for Cultural Heritage has been working on the “promotion program of the National Taskforce for the Japanese Cultural Heritage Disaster Risk Mitigation Network” commissioned by the Agency for Cultural Affairs. Under this program, with the objective of studying and promoting disaster prevention of intangible cultural heritage, for which sufficient measures have not yet been established, the TNRICP’s Department of Intangible Cultural Heritage has carried out activities to collect and share information on the locations of cultural assets as the basic information in disaster prevention and to build a network among the parties concerned in cooperation with the Department of Art Research, Archives and Information Systems. This Liaison Council meeting was held as a part of these activities by inviting persons in charge of cultural properties in each prefecture of eastern Japan. The collection of information was urged and information concerning the situations of each area and activities/challenges in disaster prevention was exchanged. 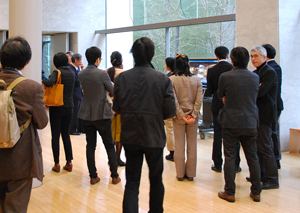 On the 22nd, 11 members from East Japan Study Group of Museum Attendants Specialized in Folklore , the co-host of this meeting, also participated, bringing the total number of participants to nearly 40. The Department of Intangible Cultural Heritage plans to hold a Liaison Council meeting for people in western Japan in late autumn and a meeting of the Conference on the Study of Intangible Folk Cultural Properties in December under the theme of disaster prevention. We will continue to make efforts to further study and promote “disaster prevention of intangible cultural heritage”. In this conference, based on the tentative plan for the outgas test method that was made for appropriate selection of interior materials and the results of data collection/analysis of outgas of the interior finishing materials, reports were presented on measurement of outgas concentration, visualization of airflow, the test for air cleaning function inside the full-size display case, as well as actual examples to address pollutant gases at museums. The problem of generation and retention of gas inside the airtight case is being widely recognized and a total of 135 participants, including curators, attended the meeting from various parts of the country. At the Q&A session, many questions were raised concerning countermeasures, etc. that should be required for actual display cases. Although this issue will not be included in the next mid-to-long term project, we are planning to produce and publish a “pollutant gas management manual” within the next fiscal year for use of museums. 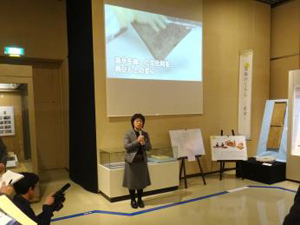 Two workshops titled above were held, including the 1st workshop at the Minami Soma City Museum on November 4th, 2015 and the 2nd workshop at the Shirakawa Branch of the Fukushima Cultural Property Center on January 28th, 2016. The workshops included lessons on basic knowledge of radial ray, practical training of how to measure radioactivity, and experience of dust removal. As for the 1st workshop that was the first of its kind held in Hamadori, the people seemed to have been looking forward to getting skill concerning the radiation accident and participated in the workshop in an enthusiastic manner. A practical training on how to deal with plants was also included by using botanical specimen in drying as teaching material. In the training, it was explained that radiation dose rate was higher in soil attached to the roots than in the leaves. 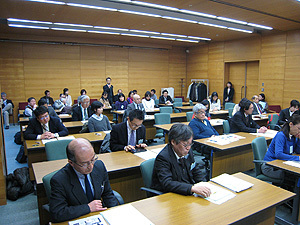 Further, as it was found that there was a delay in delivering information regarding how to deal with materials damaged by the tsunami disaster that had been discussed in Tokyo in May 2011, the methods of the squelch-drying technique were offered (30 participants). As for the 2nd workshop, how to deal with materials damaged by water disasters that might possibly occur in the future was added to the training programs (17 participants). In nearly 5 years since the disaster on March 11th, 2011, the radiation dose rate in Fukushima has dropped except in some areas and the people who had worked on rescue of cultural properties in Fukushima at that time were subsequently replaced by younger generations. Aiming to prevent deterioration in disaster-prevention awareness and the related skills, we would like to continue holding the workshop every year and support people who work on excavation of Hamadori where post-disaster reconstruction is delayed and who work on rescue of cultural properties there. Under the Cultural Properties Rescue Operations in Fukushima Prefecture of the Committee for Salvaging Cultural Properties Affected by the 2011 Earthquake off the Pacific Coast of Tohoku and Related Disasters, cultural properties t evacuated from the museums located in the former restricted areas of Futaba, Okuma and Tomioka Towns were tentatively stored in the school buildings of the former Soma Girls High School (Soma City). 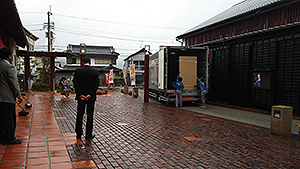 Excluding large or particularly heavy objects, almost all objects have been transported and stored in the temporary storage of the Shirakawa Branch of the Fukushima Cultural Property Center to be utilized for exhibition after dust removal, cleaning and recording. Due to longer-than-expected tentative storage, conservation environments in Soma City were examined again on October 15, 2015. After collecting the installed data loggers for temperature, humidity and illuminance, we measured the surface temperatures of the walls in the classrooms and insulation board applied on the windows for shielding. We also checked visual inspection of the objects for any damage incurred by insects and mold. Desiccant dehumidifiers installed in the classrooms where objects were stored had prevented the rooms from becoming highly humid even in the seasons with high relative humidity such as the rainy season and summer, maintaining their humidity at 50-60% rh in general from late February to mid-August. This means that the materials were not in a mold-active condition. We also found that the intensity of illumination was somewhat high and the temperature of the space up to 1 m away from the window was easily affected by the external environment. For those objects for which mold was a real possibility, we conducted cleaning operations. We will continually consider how to maintain better environments at the tentative storage sites based on our collected basic data. 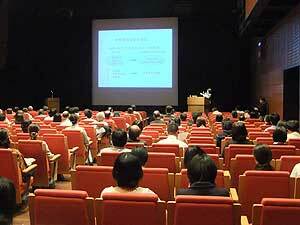 We held a workshop on “the Minamata Convention on Mercury” at the Tokyo National Museum Lecture Room on June 9, 2015. The Convention stipulates comprehensive regulations to reduce the risks of mercury on human health and the environment, and was adopted and signed on October 10, 2013, at a diplomatic conference held in Kumamoto Prefecture. It includes limitations on the use of mercury as well as a ban on the manufacturing, import or export of mercury-added products, also having effects on cultural property conservation. Thus we discussed the contents of the Minamata Convention on Mercury and its impact with representatives from collaborative partners of the Center for Conservation Science and Restoration Techniques having a large variety of expertise, such as the Tokyo National Museum, the Kyoto National Museum, the Nara National Museum and the Nara National Research Institute for Cultural Properties, as well as Cultural Affairs Agency officials in charge of the matter and representatives from the agency’s fine arts division. As for cultural property materials and techniques using mercury, we agreed to carefully monitor the future direction of regulations in order to reduce negative effects as much as possible on the restoration and replication of cultural properties such as cinnabar as an electroplating technique or a drawing material and the replication of Daguerreotype　pictures. In addition, we also agreed to act to express opinions when necessary. Meanwhile, before the production of mercury lamps and fluorescent lamps is discontinued, we decided to exchange views on the use of LED lights and its beam quality evaluation. In the workshop, we could shed light on problems from various perspectives such as a natural history sample, academic sample and modern industrial devices using mercury and the disposal of waste soil at excavation sites, and we realized the very wide range of expertise. 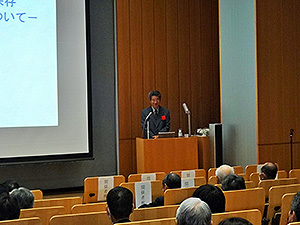 ISHIZAKI Takeshi, the former Deputy Director General of the National Research Institute for Cultural Properties, Tokyo (NRICPT), retired at the end of September 2014. He has continued his research as a professor at the Institute for Conservation of Cultural Properties of the Tohoku University of Art and Design. He delivered a lecture about the results “Conservation of Cultural Properties and Their Surrounding Environments: A specific focus on water-related problems” (Fri. March 6 2015, at the Seminar Hall in the basement) describing the results of his previous and current research. Professor ISHIZAKI, he clearly explained how moisture in soil freezes to form ice lenses and he described the movement of these ice lenses based on soil physics, his field of expertise. He described his study of rainwater penetration to stone through an analysis of moisture and heat transport. He also cited examples that explained the causes of the weathering of the stone Buddhist statue in Ayutthaya and low temperature control method during the dismantling of the stone chamber of the Takamatsuzuka Tumuli. These topics illustrate how he has focused on moisture movement in porous materials such as soil, brick, and earthen walls. He also talked about applying the outcomes of his research to the conservation of historic buildings, storehouses with plaster walls, stone structures, and exposed archeological remains. He remarked on the fact that there are few researchers in the field of safeguarding cultural properties, and he encouraged joint studies with universities and other research institutions. 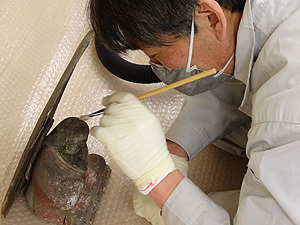 Since April 1995, the Institute has collaborated with the Graduate School of Tokyo University of the Arts to conduct a Course on Preventive Conservation in the Graduate Department of Conservation. Six researchers from the Institute are teaching graduate classes on conservation conditions and conservation materials. In the new school year, there will be 21 first-year master’s students and 9 first-year doctoral students entering the Graduate Department of Conservation. 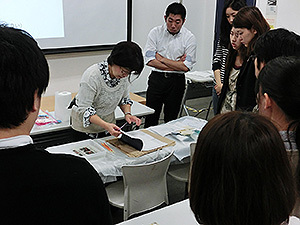 A first-year master’s student in the Conservation Materials Program (advisor: HAYAKAWA Noriko, Adjunct Associate Professor) and a second-year master’s student in the Museum Environment Program (advisor: SANO Chie, Adjunct Professor) have been accepted into the Course on Preventive Conservation. Researchers from the Institute will serve as thesis advisors for these 2 students. Researchers from the Institute conduct a broad range of research, so they can foster researchers in a vast area of conservation science that is not covered by existing courses in the Graduate School. This is how the Graduate School benefits as a result of collaborating with the Institute. Students in other courses also have the ability to question researchers from the Institute. Staff members who act as instructors have the chance to identify unresolved issues through student questions and student interest, further spurring their own research. Another productive year is beginning as students dive into new fields. The nuclear accident at TEPCO’s Fukushima Daiichi nuclear power plant resulted in repositories in the towns of Futaba, Okuma, and Tomioka in Futaba County being contaminated with radioactive material. 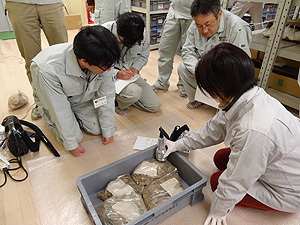 Cultural properties that were rescued from these repositories have ultimately been stored in a temporary repository at Mahoron, the Shirakawa Branch of the Fukushima Cultural Property Center. In order to improve storage conditions, the Center for Conservation Science and Restoration Techniques is continuing a study in cooperation with curators at Mahoron. From March 25–26th, temperature and humidity were measured and levels of surface contamination on some rescued cultural properties were measured. Most of the items were found to be free of contamination by radioactive material. Wrapping on some of the items that had slight levels of contamination was replaced, and dust was removed and items were cleaned with a conservation vacuum cleaner. Measurements of radiation levels before and afterwards indicated that the cleaning was effective. In addition, curators who will manage rescued cultural properties received a course on methods of measuring surface contamination and they learned procedures for performing those measurements. Mahoron plans to successively measure and record surface contamination on all rescued cultural properties. The Great East Japan Earthquake of March 2011 was accompanied by the nuclear accident at TEPCO’s Fukushima Daiichi nuclear power plant, which resulted in the release of large amounts of airborne radioactive iodine and cesium. Potential contamination to cultural properties by these radioactive isotopes is a concern. 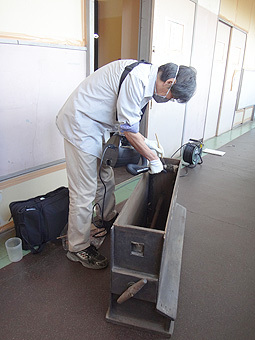 In order to ascertain the current extent of contamination to facilities handling cultural properties and cultural properties in Fukushima Prefecture, to establish techniques to measure surface contamination attached on cultural properties, to define criteria for moving cultural properties, and to explore decontamination techniques, the National Research Institute for Cultural Properties, Tokyo conducted a Study of Measures to Prevent/Mitigate Radioactive Contamination to Cultural Properties in conjunction with the National Institutes for Cultural Heritage, the National Museum of Art, the Japanese Council of Art Museums, the Fukushima Prefectural Board of Education, and cultural facilities in Fukushima Prefecture. The study was conducted over a 2-year period from 2012–2013. 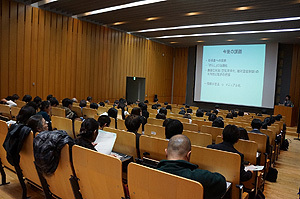 A Seminar on Measures to Prevent/Mitigate Radioactive Contamination to Cultural Properties was held on February 12, 2014 to report the overall findings of that study. 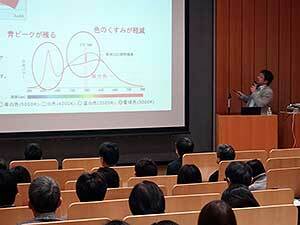 The study was led by ISHIZAKI Takeshi, Deputy Director General of the Institute. On February 12, Mr. ISHIZAKI explained the gist of the study, and HIGAKI Shogo (the University of Tokyo) delivered a lecture on behavior and hazard of airborne contaminants. ITO Kyo (Fukushima Prefectural Museum of Art) then provided a helpful description of actions in museum after accident at power plant. Afterwards, SANO Chie and KITANO Nobuhiko (both from the Center) reported on activities of the Working Group on Measures to Prevent/Mitigate Radioactive Contaminants to Cultural Properties (the seminar had 36 attendees who were not affiliated with the Institute). Two documents that were distributed at the Seminar were Risk Management for Museums: Focusing on Steps to Deal with Dust Contaminated by Radioactive Isotopes(02/10/2014 Draft) and Basic Concepts of Decontamination of Cultural Properties (02/10/2014 Draft). These documents are available on the Institute’s website (in Japanese). To mark the third year of Research on Conditions for Conservation of Cultural Properties, a research project of the Center for Conservation Science and Restoration Techniques, a conference was held on January 27 (Mon. ), 2014 based on results of research thus far. The conference covered the topic of Predicting Pollutant Concentrations and Assessing Air and Climate Remediation Technologies in 3 areas: (1) devising testing techniques to select suitable materials for use in places where cultural properties are stored, (2) examples of air and climate control via prediction of pollutant concentrations based on data from material emissions testing of interior finishing materials, and (3) elevation of concentrations of pollutant gases when raising temperature settings in museums to reduce energy use and various techniques to reduce those concentrations. Many of the attendees were aware of actual issues such as construction of new buildings and renovation of and addition to existing ones, building of new exhibit stands, and selection of display materials. Attendees eagerly asked questions about topics such as methods of ventilation, materials selection, specific responses, methods of measuring pollutant gases, and methods of identifying sources of pollution. Proposals were also offered on topics such as establishing standards for selection of products and whether or not to work on drafting a manual on air purification (93 of the conference attendees were from outside the Institue). “Science for Conservation” is the research bulletin of the Center for Conservation Science and Restoration Techniques and the Japan Center for International Cooperation in Conservation of the National Research Institute for Cultural Properties, Tokyo. The latest edition, Vol. 52, was published on March 26, 2013. This edition features 4 papers and 22 reports on the latest findings from various projects by the Institute, such as research to conserve damaged cultural properties and results of studies of steps to combat biodegradation of the Kitora Tumulus. Starting with Vol. 1, every edition of Science for Conservation is available in PDF format on the Institute’s website (http://www.tobunken.go.jp/~ccr/pub/cosery_s/consery_s.html). Over the past few years, white LED technology has progressed dramatically. Improved color rendering and increased variation in color temperatures have reached the level where installing white LEDs as lighting for exhibitions can be considered. Such lighting requires color reproduction and creation of various lighting effects. That said, many museum staffs have expressed concerns about the effects of such lighting on materials, differences between objects viewed under that lighting and under conventional lighting, and whether power consumption can be reduced commensurate with the costs of installation. 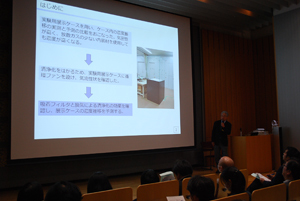 Given the need to share information on the development of white LEDs and the current state of exhibit lighting, a conference on reducing energy use in museums was held on Feb. 18, 2013. The Conference featured respective talks by two experts on development of LED technologies and two curators from art museums that installed white LEDs as exhibit lighting. One expert on the development of LED technologies, FUJIWARA Takumi, President of Light Meister Co., Ltd., discussed the basic principles of white LEDs and the latest technological trends. The other expert, MIYASHITA Takeshi of CCS Inc., talked about the development of new type of white LEDs, stimulated by violet LED, which emit light that is closer to natural light than that emitted by conventional white LEDs. MIYASHITA also talked about the installation of those LEDs in museums. The Yamaguchi Prefectural Art Museum installed white LEDs as exhibit lighting a while back. KAWANO Michitaka of the Art Museum described exhibits and staging that fully capitalized on the features of LED light sources, such as control of color temperatures. TAKANASHI Mitsumasa of the National Museum of Western Art described reduced energy use based on measurements. In addition, TAKANASHI described the characteristics of white LEDs from the perspective of someone who is constantly in contact with artworks, i.e. differences between oil paintings viewed under that lighting and under conventional lighting. Over the past few years, production of energy-inefficient incandescent bulbs has gradually diminished and halted as a step to combat global warming. In addition, the Minamata Convention on Mercury, which is expected to be adopted globally this October, is expected to dictate reduced production of products containing mercury after 2020. Continuing to use fluorescent lighting may no longer be limited. Installation of alternative lighting is inevitable for facilities handling cultural properties. Reflecting this fact, the Conference was attended by 130 individuals from around the country. The question-and-answer portion covered a range of topics, from issues concerning materials conservation such as elimination of ultraviolet radiation and temperature changes to issues concerning color temperatures and staging. In order to deal with issues raised during the Conference and to meet the needs of relevant personnel, we will continue to gather the latest information on organic electro-luminescence, the next generation of lighting to follow white LEDs, and we will continue to study and assess that lighting from the perspective of conservation. We will also convey the needs of museums and art museums to lighting developers and facilitate the use of these light sources as exhibit lighting. In the summer of 2011, electricity users served by Tepco and Tohoku Electric Power were asked to reduce power use (from 9 AM to 8 PM) by 15% from peak levels in 2010. How would museums and art galleries that handle important cultural properties survive? And what problems would they face as a result? The Center for Conservation Science and Restoration Techniques held a conference to review temperature and humidity settings in the exhibition and storage spaces of museums and art galleriess with a supplemental focus on “Reducing Energy Use in Museums and Art Galleries” (the event took place on February 17 (Fri.), 2012 in the Institute’s basement seminar hall and had 66 attendees). A Survey on Measures Taken to Reduce Museums’ Power Consumption in the Summer of 2011 was conducted from December 2011 to January 2012 with the cooperation of curators who had completed training for museum curators in charge of conservation. Results of the survey were summarized by Chie SANO. In most museums or art galleries, curators seek to avoid changing environmental conditions in storage rooms. At institutions that change the temperature of their galleries, the visitors experience discomfort and their stay in the galleries tends to be short. In some instances, insects and mold infestation and , odors are increased, and metal objects are corroded. In addition, there are concerns about a lack of temperature and humidity control resulting from changes in environment control settings. Mr. Osamu FUKUNAGA of the National Art Center, Tokyo discusses views on temperature and humidity settings at art museums. Cultural properties vary widely, lending institutions have different views, and local climates, building structures and designs, and curating vary. These facts preclude the establishment of uninform criteria for exhibition conditions, but communication to reach an agreement on those conditions is crucial, as Mr. FUKUNAGA noted. Ms Mitsue NAGAYA reported on controlling conditions following closure of a special exhibition gallery to reduce daytime power consumption in the summer of 2011. Ms NAGAYA presented examples of items that were kept in good condition through nighttime climate control. Takeshi ISHIZAKI reported on current trends and approaches overseas with regard to temperature and humidity settings to conserve cultural properties. ISHIZAKI cited reports of experiments on the extent of deformation in mock specimens intended to ascertain the effect of changes in humidity on the components of cultural properties. ISHIZAKI also indicated the extent of brief fluctuations in a well-controlled environment and he provided examples of research into an approach that allows some fluctuations in accordance with seasonal changes (temperatures are adjusted but humidity is constant). Last, Mr. Takashi MATSUO of the Shimizu Institute of Technology described the latest energy-saving technologies used in office buildings. Mr. MATSUO new techniques being tested in relatively large areas to efficiently use energy, such as utilizing shade and reducing peak energy use in conjunction with neighboring areas. New methods of controlling temperature and humidity by allowing temperature adjustments at a constant humidity or allowing greater fluctuations must be carefully assessed to determine if they truly have no effect on cultural properties, and assessments must be repeated, discussed, and understood by all relevant personnel. The Conference on “Reducing Energy Use in Museums Considering Environments for Conservation of Cultural Properties” provided a valuable opportunity to see the steps in risk management: new information on risk assessment is now available, and risk communication, or how that information is evaluated and shared among stakeholders, is becoming evident. 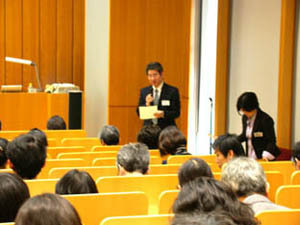 On October 19 (Tuesday), 2010, the National Research Institute for Cultural Properties, Tokyo hosted a workshop titled as in the above, with the co-host being the Kyushu National Museum. This workshop was intended for the persons in charge of conservation at the museums, art museums, etc. and the persons in charge of protection of cultural properties in local governmental organizations in the Kyushu, Chugoku and Shikoku districts. During this workshop, the colors of five Japanese paintings which changed due to the tent fumigation in the warehouse by use of a drug with the active ingredient of aluminum phosphide, which is not allowed to be used for the fumigation of cultural properties, was discussed. In response to this accident, we considered the urgent need to promote understanding of the fumigation of cultural properties, and held the workshop in cooperation with researchers whom are collaborative members of the Center for Conservation Science and Restoration Techniques. 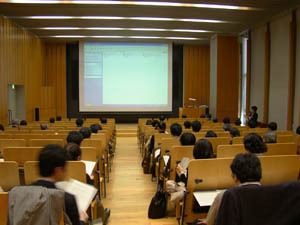 The following presentations were made: “Management of borrowed art objects for exhibitions” by Mr. Asaka Hiroshi, the Cultural Property Conservation Instructor at the Arts and Culture Section of the Agency for Cultural Affairs; “Details on the chemicals designated by the Japan Institute of Insect Damage to Cultural Properties” by Mr. Miura Sadatoshi, the Director of the Japan Institute of Insect Damage to Cultural Properties; “Characteristics of gas fumigant and impacts on cultural properties” by Ms. Sano Chie, the Head of the Conservation Science Section in the Center for Conservation Science and Restoration Techniques at the National Research Institute for Cultural Properties, Tokyo; and “Fumigation performed in museums – as part of IPM (Integrated Pest Management)” by Ms. Honda Mitsuko, the manager of the museum science section of the arts and culture department at the Kyushu National Museum. 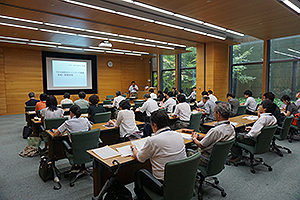 We reconfirmed that safety comes first for cultural properties, and appealed to the participants to take part in training, etc., collect information and improve techniques in order to facilitate the safe execution of gas fumigation used as an insecticide and fungicide (at the Kyushu National Museum, with 126 participants).